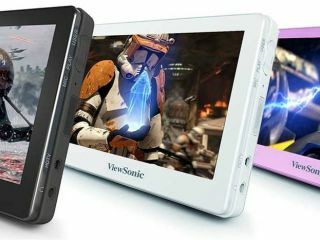 ViewSonic is expanding its product range beyond its traditional monitors and projectors, releasing a slew of new devices later this month – with these new, surprisingly-affordable portable media players among the first on the market. ViewSonic's VPD500 and VPD400 MovieBook line-up offer users bigger screens and better multimedia support for pretty much all of the major music and video file formats out there, including AVI, RMVB, FLV, MP3, WMA and WAV, APE and FLAC. The VPD400 weighs in at a mere 134g with a 4.3-inch "crystal clear TFT-LCD display" while the VDP500 offers a slightly larger 5-inch display – both featuring high-res, 800x480, 720p video output, 8GB of built-in memory and a micro SD card slot. Battery-life is also pretty impressive, with both devices capable of around four hours of video playback or around 15 hours of music playback off one charge ("making them ideal for viewing movies, listening to music, sharing photos, all while travelling or commuting to work" ViewSonic kindly reminds us). The best news? The ViewSonic MovieBook VPD500 and VPD400 are out in October priced very competitively a £115 and £105, respectively. For more, head over to ViewSonic Europe's website.